Stitch Story: An Inspiring Vintage Yarn Ad! If you have been reading my blog for a while, you know how I adore vintage yarn ads! I came across this one yesterday, and it made me wish that I was a little more glamorous when I crochet. She really puts me to shame in my "house clothes". 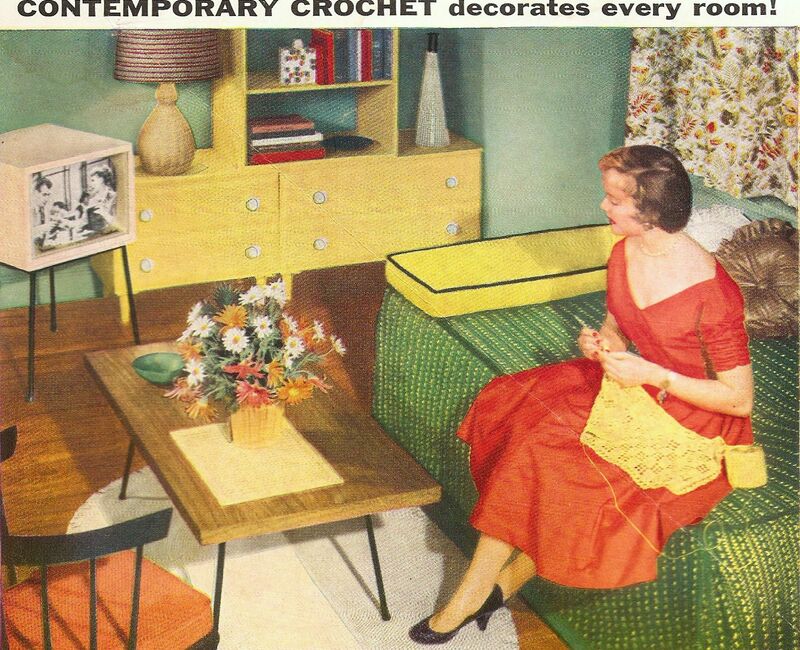 I also love that she is watching "I Love Lucy" while she crochets. I think I would have thrived in the 1950's, as I have always been attracted to things from that era. It made me wonder how your surroundings effect your crochet outcome? Maybe the next time I am aiming for an elegant design, I will put a bouquet of flowers on the table and dress up a little for the occasion! Hhhahhahhahaaaa Shelby YES do that and post the pics - hilarious!! I would say it would boost inspiration no end.